Today is the fiftieth anniversary of the assassination of President John F. Kennedy. 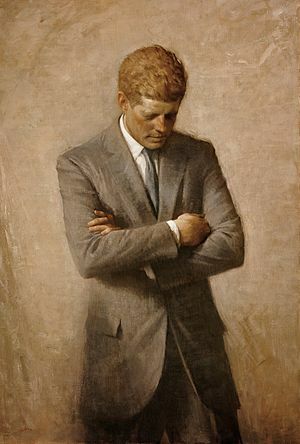 Kennedy was before my time; the earliest president I remember is Carter, and I do not have the sort of emotional connection to his presidency and his death that someone of the previous generation, who lived through it, might. To me, President Kennedy is a matter of history. Looking back, he does not seem to have been an especially good president. He wasn’t a bad one, but his administration seemed to have lacked accomplishments when compared to his aspirations. Kennedy, perhaps, belongs somewhere in the middle, maybe a little higher than most. As the myth of Camelot fades into the past, Kennedy’s standing,as ranked by historians, has been steadily dropping, while some presidents who were less glamorous but more accomplished, such as Eisenhower, have risen. There may be justice in that. And yet, there is something to John F. Kennedy and his aspirations. Kennedy had a way of expressing a sort of optimism about the country he served, a way of telling his fellow Americans that they were capable of doing more, of being better people. Kennedy appealed to what was best in us in a way that no president since, except possibly for Reagan, could. Perhaps that is the most important role a president can play, to be a sort of national cheerleader. In a strange sort of way, being assassinated was the best thing that could have happened to Kennedy. If he had lived, he never would have been held in such high esteem for so long. A hard fought re-election campaign and, assuming he won, a second term might have tarnished his image. Increasing US involvement in Vietnam might have made him as unpopular as Johnson by 1968. Of course, Kennedy might not have made the same mistakes as Johnson did, but he might have made other mistakes all his own. An elderly Kennedy past his prime might have been as unattractive as his brother Ted. Because he was cut down while he was still relatively popular, the public never had a chance to be disillusioned. The promise is always more enticing than the realization. Maybe the assassination was good for his posthumous reputation, but it was not good for the country. Kennedy’s murder shocked the nation in a way that Garfield’s and McKinley‘s didn’t. Perhaps this was because it happened in the television age. It is one thing to read about an event, quite another to see it. Then too, neither man was as much in the public eye as Kennedy. Lincoln’s assassination was traumatic, but it occurred at the end of the most traumatic period in American history. Shocking as it was, I wonder if many Americans had become somewhat numbed by the horrors of the Civil War. Kennedy’s assassination came at a time in which the United States was prosperous and at peace. It must have seemed completely unexpected to the American people. I am not sure if there will be much notice taken of the assassination by 2063. By then, no one will be alive who remembers the event and it may be that it will pass into the mists of history. I hope that we will not have a fifth assassination to remember. I may not like Barack Obama very much, and I can’t tell what I might think of his successors, but I would hate to see the country have to go through something like what happened on November 22, 1963.